However, God’s holy word also makes a very strong distinction between some sins, and what He sees as even “greater” sins in certain circumstances. All are sin. All are ugly and unacceptable before God. But at the same time He still makes a strong distinction in some cases, between some sins and certain other, “greater” ones. For example, in 1 Kings 11–13 we have the developing story of King Jeroboam, who, because he did not want the people to go back to alignment with the house of David, took it upon himself to instill and insist upon worship which “he had devised in his own heart” (1 Kgs. 12:33), and which consummately contradicted the direct commandments of almighty God (See 1 Kgs. 12:25–33). “After this event Jeroboam did not turn from his evil way, but again made priests from every class of people for the high places; whoever wished, he consecrated him, and he became one of the priests of the high places. And this thing was the sin of the house of Jeroboam, so as to exterminate and destroy it from the face of the earth” (I Kgs. 13:33–34). God made a “sin-distinction” in this case. Jeroboam’s decision to follow the example of Israelite worship (i.e., “like the feast that was in Judah” — 1 Kgs. 12:32), but to do so in ways which he desired and devised in his own heart, instead of doing such things in loving obedience to the clear-cut commandments of God regarding exactly how these spiritual elements were to be carried out and conducted, became known as, a “G-R-E-A-T sin” (2 Kgs 17:21; E-M-P-H. mine — DED). 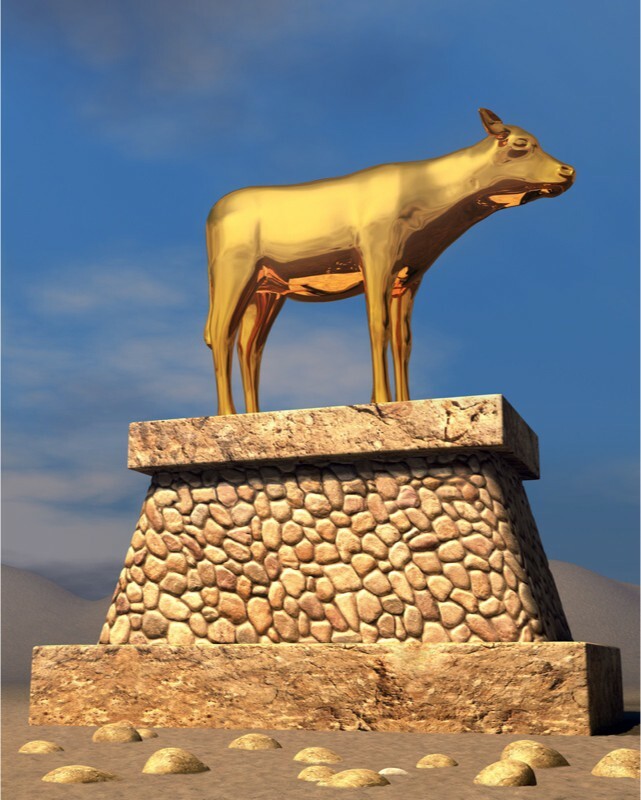 In fact, of the four times this phrase “great sin” — making a definite distinction when it comes to some sins versus others — is used in the bible, three of them are in reference to man-desired, devised, and demanded “golden calf” worship, which directly disobeys and completely contradicts the clear-cut commandments of God in Scripture when it comes to worship (Exod. 32:30–31; 2 Kgs. 17:21). Why is this particular sin so directly and distinctly elevated by God to the status of a “great sin,” as opposed to just any other sin? I don’t know. But perhaps it is in part due to the fact of just how widespread of a path of destruction and devastation it caused amongst His people, as so many were so swiftly swept away down that wide and easy path and away from God (1 Kgs. 14:16), to their utter, tragic, and desolate destruction. In support of that, all one need do is read up through from 1 Kings 16 all the way to 2 Kings 17, and make a list of just how many additional kings were condemned for walking in the sinful ways, or “great sin” of Jeroboam. That list will not only surprise you due to its number, but will ultimately be seen to eventually encompass and culminate in both kingdoms of God’s people being destroyed by God, for faithlessly following the sinful example of that same “great sin” as well (2 Kgs. 17:1–23). Because we in the churches of Christ (Romans 16:16) today, believe that the word of God is everything it claims to be (i.e., the very word of God — Ps. 19:7–11; 2 Tim. 3:12–4:4; 2 Ptr. 1:16–21), we practice the things we accept and insist upon, predicated upon a process of biblical discovery referred to as “command, example, and necessary inference.” That is to say, we make it our desire to faithfully obey and initiate all of those things which we see either commanded in Scripture by God, or see an example of demanded by the word of God, or that we see as obviously, necessarily inferred, by either the command or example we are seeking to obey and institute. However, because “Scripture cannot be broken” (Jn. 10:35), we, at the same time, MUST NEVER, EVER, EVER allow ourselves to follow in the eternally fatal footsteps of Jeroboam by seeking to follow some example (or setting up something “like” God said), while completely contradicting, overriding, and disobeying God’s direct commandments as to exactly HOW He clearly commanded He wanted that particular action taken (See: Lev. 10:1–2; 1 Sam. 13–15; and etc)! Now it’s true that to NOT do something which God showed us by example He wanted us to do, is indeed sinful (Jms. 4:17). However, to initiate any example, but to do so in accordance with our own selfish and time-sensitive desires instead of in faithful compliance with His direct commandments, would be even worse yet, and would be to ultimately commit the far “greater sin!” This, because we would have directly disobeyed His divinely-delivered and demanded instructions as to HOW it was to be done, and would be therefore found faithless, to the absolute guarantee of our own eternal destruction! We Cannot Afford To “Make God In Our Image,” Or To “Worship” In Accordance With Any Way We May Want! Just as Jeroboam recognized the example of God wanting His people to worship, we too, have examples of God wanting His New Testament people to have established elderships in their congregations (Acts 11:30, 14:23, 15:1–22, 20:17, 21:18; 1 Tim. 5:17; Titus 1:5; Jms. 5:14; 1 Ptr. 5:1). However, there are certain, Scriptural, locked in stone, forever firmly fixed in heaven (Ps. 119:89), absolute truth (Jn. 17:17), “musts” and requirements that these men — and their wives as well if these men are truly going to be considered to be qualified by God Himself — must meet in order to be elders. There is no mistaking, contradicting, eliminating, compromising, or editing them. They are clear. They are black and white. They are the absolutely and utterly required commandments of almighty God Himself, and must be obvious and in place in those men’s and women’s lives, to all of the sheep in the local flock (Jn. 10:1–13), long BEFORE those couples can ever even be considered, to help the congregation be in compliance with the biblical example of elders as aforementioned. In addition to having to be shepherds the sheep will follow, these must be men and their wives who truly desire the work and want the job (1 Tim. 3:1); otherwise, they do not meet God’s very first requirement and any further proceeding at that point, is pointless. But if on the other hand, they do meet that requirement, then it will be obvious to everyone in the congregation because they’ll already be doing that work — well and always. In addition to and amongst all of the other requirements they must meet, these men MUST also be “blameless, the husband of one wife,” and “one who rules his own house well, having his children in submission with all reverence” (1 Tim. 3:2–5). He MUST also be able, or apt, or anxious to teach (1 Tim. 3:2). This would be one who can’t wait to assume the pulpit preaching and teaching duties while the preacher is away, and/or one who almost begs for the opportunity to teach bible classes both at home and in the church. “Likewise their wives MUST be reverent, not slanderers, temperate, faithful in all things” (1 Tim. 3:11; emphasis mine — DED). And while these are only the tip of the iceberg, they must suffice for now due to space. But the bottom line is exactly this: To seek to follow the example we see in Scripture of installing elders, while at the same time disobeying, compromising, or not complying with even what seems to be the most minimal of these direct commands of God in the process — to do “something like” they say, but not completely complying — is to follow in the very fatal footsteps of Jeroboam. The absolutely necessary inference included in every, single, one of those Scriptures that show those first century congregations which had elders, is that they had men and women who absolutely met those God given requirements, qualifications and commandments — or else they would either NOT have had them, or would NOT have been found faithful to God, by God, anyway! And as to those men who might one day be biblically qualified to be elders, one great irony is that they will become obvious to the congregation by virtue of the fact that they will already be doing the work of an elder — the work of an elder such as silencing and shutting down any and all of those who might be clamoring for a compromise of God’s commands, all in order to be able to claim that we have somehow satisfied a biblical example, we don’t currently have the means to biblically fulfill now (See: Titus 1:5–14). Why, to have to disobey, discard, or disregard any of God’s direct commands and requirements regarding elders’ qualifications just in order to have them, is in the same exact category of blatant apostasy as disobeying, discarding, and/or disregarding any of God’s direct commandments and requirements regarding leaders’ gender restrictions in order to have church leaders (1 Cor. 14:33–37; 1 Tim. 2:8–12); or, disobeying, discarding, and/or disregarding God’s acapella, congregational singing commands in order to have “music” (Eph. 5:15–20; Col. 3:16–17; and etc.)! In conclusion then: Yes; to have men and women that were completely qualified according to God’s commandments and requirements to be elders and deacons and their wives, and then to refuse to follow the biblical example and install them, would be a dangerous, heinous, and blatant sin. In fact, congregations ought to be continually working towards maturing Christian couples to one day obediently fill and fulfill that role. However, to install people to those positions in order to set up something like the N.T. example, in order to just simply say that we have them — while impetuously, contemptuously, and directly disobeying and discarding the necessary inference, commandments, and requirements which God has placed on those people and positions — has to be a far worse affront to Him than our nothaving elders if we don’t have the qualified people to begin with! I would personally think that direct disobedience to His requirements would be by far, “the greater sin,” and one I certainly would not want to have to face God with having committed and be responsible for having begun carrying a congregation away with. Now… what about you?